No matter how honed your skills are with a razor blade, nicks & cuts are most likely going to happen. When the unfortunate nick or cut happens, the problem then becomes how to stop the bleeding fast and soothe the skin. 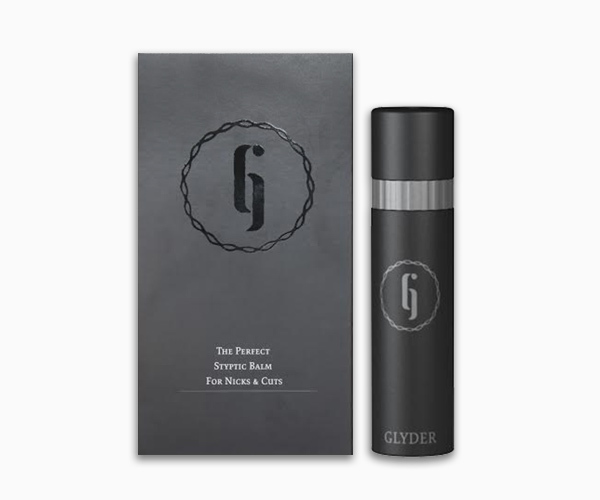 I may have found the perfect solution in a Styptic Balm by Glyder. I really enjoy adding value here for you guys and letting you know about cool new products that can help make your lives easier. Glyder is no exception and I’m happy to have the opportunity to introduce them to you. Glyder was founded by Kaivan Dave from Chicago, a consultant in the personal care industry. Kaivan was sick & tired of men using toilet paper on their faces to stop bleeding from shaving cuts, so he developed Glyder and he’s on a mission to help men break their habits with toilet paper, one square at a time. He’s upgraded everything about the standard styptic pencil and updated it into a form factor that works just like a lip balm. A styptic pencil is a specific type of anti-hemorrhagic agent that works by contracting tissue to seal injured blood vessels. Styptic pencils have been used as a safe and effective way to stop minor cuts from continuing to bleed, but until now, they’ve come in chalky sticks or smelly liquids. Glyder’s Perfect Styptic Balm combines vasoconstrictors with healing Aloe Vera, Argan Oil, and Vitamin E to soothe and protect wherever you’ve nicked yourself shaving. Glyder’s patent pending formula contains anti-hemorrhagic agents that facilitate platelet plugging which significantly decreases bleeding. We use the same technology used by the military. The good thing is that it couldn’t be easier to apply. The balm is packaged in an ultra-grippable, retractable tube (just like lip balm), making it easy use and a lot more hygienic than toilet paper. Apply the balm gently over shaving cuts, similar to how you would apply a lip balm. The ingredients do the rest getting you back to business quickly so you’re not a slave to the toilet paper roll. Check out their video to see how it works. Even though this is a sponsored post, I can honestly say that I’m happy to have found Glyder. The product works as advertised, lasts a long time, smells great and it’s inexpensive. They even offer a 30-Day money back guarantee. It’s a no-brainier. Post a comment below and let me know how often you accidentally nick yourself shaving, or post your feedback on Glyder. Don’t forget to click on the Glyder logo below to go straight to the Glyder site and order some for yourself. It’s a shame you don’t have a donate button! I’d most certainly donate to this outstanding blog! I guess for now i’ll settle for book-marking and adding your RSS feed to my Google account. I look forward to new updates and will share this blog with my Facebook group. Chat soon! Hello my loved one! I wish to say that this post is amazing, nice written and include approximately all vital infos. I would like to peer extra posts like this . Howdy! I understand this is somewhat off-topic but I needed to ask. Does running a well-established blog like yours require a lot of work? I am completely new to operating a blog however I do write in my journal every day. I’d like to start a blog so I can easily share my personal experience and thoughts online. Please let me know if you have any suggestions or tips for new aspiring blog owners. Appreciate it!